Immediately after the ski center of Chelmos, the dirt road crosses a dense fir forest, which is fading slowly to reveal a bare alpine landscape. Beside the facilities of the ski resort on Neraidorahi top, at 2,340 m, dominates the modern telescope of the National Observatory of Athens, the largest telescope in Balkans and Eastern Mediterranean, "Aristarchos". The pride of Chelmos since 2004, it sees 7 billion light-years away from Earth. The historic monastery of Agia Lavra, 4.5 km from Kalavrita, 7.5 miles from Georgio's V Chalet Kalavrita. It was founded in the 10th century by the hermit monk Eugene, but was burnt down by the Turks in 1585 and in 1827 and by the Germans in 1943. In 1950, it was rebuilt in its current location and format. Place of Greek Revolution, Agia Lavra holds the most precious treasure, the riddled by bullets banner of revolution, precious gospels, historical objects and ceremonial tools, amulets, the vestments and the pastoral rod of Paleon Patron Germanos. Important treasures are the 3,000 printed matters in the library, the oldest of which dates back in 1502. The Place of Sacrifice, in the east section of Kalavrita, which recalls the holocaust of December 13, 1944, and the Holocaust Museum, housed in the historic building of the elementary school, across the street from the train station (cog railway), as a mark of respect for the sacrifice of more than 1,400 men, aged 14 and over, who were executed by the conquerors. 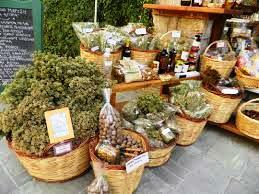 Also, in the city of Kalavrita is worth seeing the Municipal Gallery, the old Paleologina Mansion of the 15th century, the train station (“odontotos”) and to walk in the beautiful, picturesque streets, where you can buy local products. Kalavrita, one of the most historical city of Achaia, is built at an altitude of 756 meters, on the exact spot with ancient Kynetha. Kalavrita is located 77 km southeast of Patras and in order to get there, you can follow the road from Chalandritsa or the wonderful route Diakopto - Kalavrita by the cog railway. 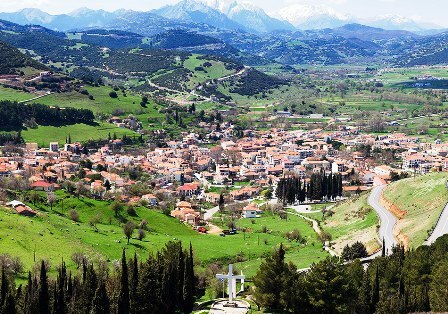 The city of Kalavrita is widely known not only for its leading role in Greek Revolution of 1821 against the Turks, but also for the resistance during the Second World War against the German occupiers. In Kalavrita was declared the revolution by Paleon Patron Germanos and the chieftains of Peloponnese who had gathered in Agia Lavra. 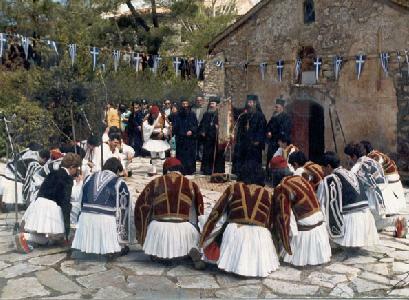 During the celebrations for the anniversary of the Revolution of 1821, takes place the representation and Fighters’ swearing, which is held annually in the Cathedral of Kalavrita. 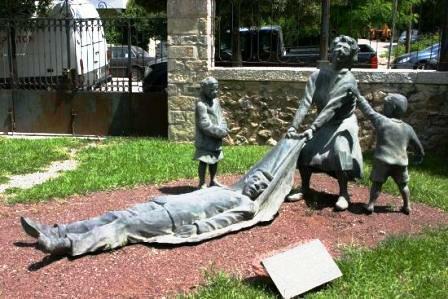 In 1943, Kalavrita experienced, in the roughest way, the German reprisals during the occupation, when, on December 13, 1943, almost all the male population was executed by the German army and the city was burned. 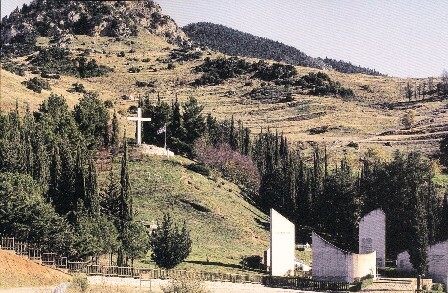 In memory of the martyred village for the Massacre of Kalavrita, above the town, rises the hill of Kapi, where the execution and the holocaust of 13 December 1943 took place. ChelmosNational Park– Vouraikos is a botanical paradise, where we found about 1,500 species of plants. Fir forests with thorny shrubs in their glades, like the endemic hawthorn or Berkia, decorate the higher slopes of Chelmos. On the west side, the soil is most fertile and the forest richest, presenting a mixed vegetation of black pine, chestnut, oak and deciduous trees like Alizari, Maple and Ash trees. Next to the rivers and the streams, we found clumps of tall plane trees and around them, a great variety of willows, poplars and oleanders. In the alpine zone, the vegetation is sparse including spiny shrubs and wild grasses. In Styx, one encounters several rare species of wildflowers, such as Viola Delphinantha, Cardamine Carnosa, Anthericum Liliago (cyclamen) and other endemic outdoor plants: Verbascum acuale, Aurinia moreana, and Gypsophila nana. Due to the inaccessibility of Vouraikos area, the vegetation is important, with the most common types to be those of bluebell, red valerian and the local endemic Achillea umbelata. Their best time, of course, is spring! In the newly created park of Chelmos – Vouraikos we meet plenty of invertebrates and vertebrates (17 in total), with the largest to be otter (Lutra lutra). However, despite its proclamation as a Park, not all are good for the fauna of the region. Unfortunately, by the mid 20th century, among the endangered species are including the golden eagle and the vultures. The latter are in danger due to the reduction of livestock, which offered them food. In contrast, there is an increase in crows, which have even penetrated in the old haunts of the large raptors. Also, the whole area has a lot of foxes, weasels, ferrets and many rodents. From mammals, the most possible to meet is the hare. 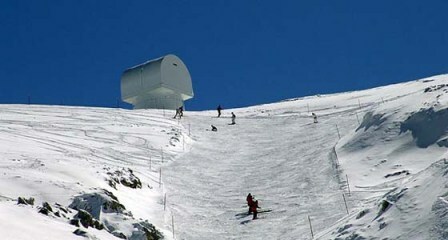 The ski center of Kalavrita, 13 km from Kalavrita, 9.5 km from “Georgios V Chalet Kalavrita”. With the most modern facilities for ski and snowboard in Kalavrita, the ski center is located on the northwest side of Chelmos and extends from Xerokampos to Neraidorahi (1,700 meters - 2,355 meters the highest peak) and has 8 lifts and 12 runs. Flagship of the ski center is Styx Lift, by which the skiers have the opportunity to enjoy the magnificent panoramic views stretching from Kefalonia to Eleusis. 2. 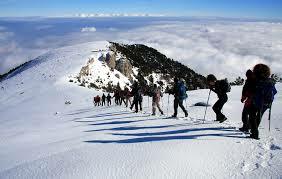 Pouliou e Vrysi (Mountain Refuge) - Asphalt: 4.7 km. These routes are outside the ski area and the dangers are lurking in winter. You should be use them only when there are experienced drivers and always with the necessary winter equipment in groups of 2-3. 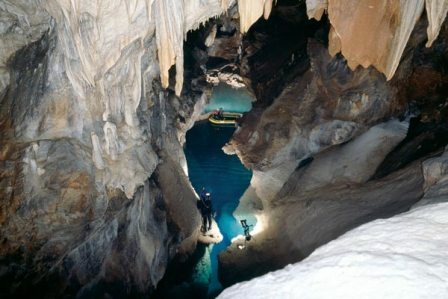 The Cave of the Lakes, 17 km from Kalavrita, on the road to the ski resort and Klitoria, 13 km from Georgios V Chalet Kalavrita. Near Kastria village, it will impress you with its unique 13 lakes, spanning in three levels (two of which are visit able), the rare beauty and its great history. An eco-speleological laboratory of international importance with labyrinthine corridors, galleries, stalactites, stalagmites, with length of 1,980 meters, 500 meters of which are exploited. To the same route towards Klitoria, after 8 km, you will find the picturesque Planitero, at an altitude of 700 meters. Approaching it, the change of scenery leaves you with the suspicion that you enter into new adventures. 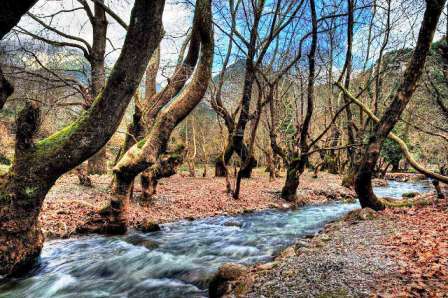 Walnut trees, countless towering plane trees with visible, over their trunks, the seals by the Forest Service of Kalavrita (species under protection, Natura 2000), and rapid waters, make up the impressive backdrop of the beautiful forest. From Planitero stems also the namesake river, on the river beds of which there are trout farms and of course, delicious trout. See the traditional watermill and try trout in the adjacent taverns. 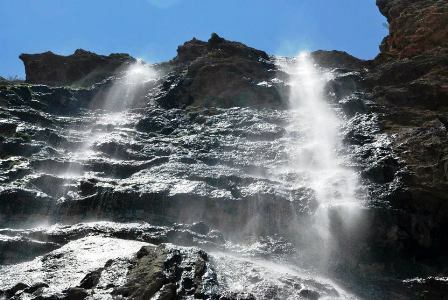 For the more adventurous nature lovers, there are interesting trekking paths to Elatofyto, Mazi (30 minutes), Ntourntouvana (6 hours), Lousous (4 hours) and Kalavrita (6.5 hours). The Church of Our Lady, Plataniotissa, 30 km from Kalavrita, on the road Aegio - Kalavrita through Pteri, 33 km from Georgios V Chalet Kalavrita. 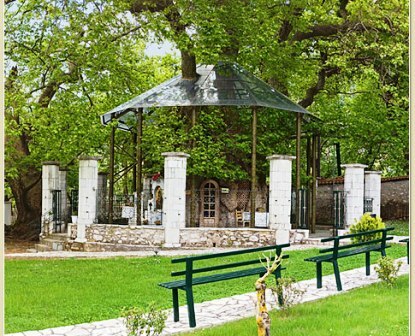 In a green setting, with plentiful cold water, this small chapel is built in a hollow of a plane tree, which was created by three plane trees that grew together, with the imprint of Virgin Holder of the Newborn. From mountainous lodge of Chelmos starts a path to the Waters of Styx, to the river springs of the infernal Krathis River. Its waters are linked to theological and philosophical ideas, such as the Eleusinian Mysteries and Orpheus-Pythagoras beliefs about reincarnation. Here, according to mythology, it is said that Achilles was baptized and became immortal. So, this is one of the most important monuments in the area. 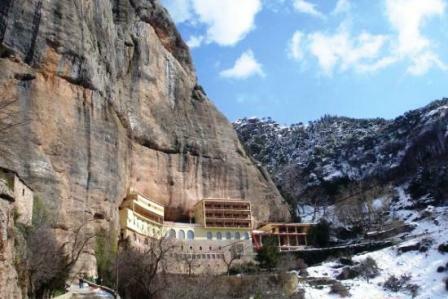 The historic Monastery of Great Cave, 10 km from Kalavrita, on the road connecting the highway Patras - Athens to Kalavrita, 13 km from Georgios V Chalet Kalavrita. According to tradition, the monastery was founded in 362 AD by the monks, Simeon and Theodore, into a natural opening of a cave, where Virgin Mary’s icon was found. It is built at a height of 924 meters, surrounded by the beautiful landscape of Chelmos Mountain, above the steep ravine of Vouraikos River, which is crossed by the cog railway, near Zahlorou village. Lighthouse of Orthodoxy and Hellenism, the Great Cave keeps the Sacred Miraculous Image of Our Lady, Megalospileotissa that is made ​​of wax and fragrances by the Evangelist Luke. The walls of the church in the monastery are covered with frescoes from 1653. Also, there, are kept Gospel manuscripts, vestments and sacred relics. Center of resistance against the invaders, and although it suffered several attacks, the Monastery of the Great Cave never conquered. The fact that stood out was the repulse of Ibrahim’s invasion, in June 1827, when the Abbot Damascene replied to the Turks: "... it is impossible for us to worship you... if you come here to fight us and beat us, this will not be a great bad thing, because you will beat priests, but if you lose... shame on you..." And indeed he was forced to retreat due to this brave defense. 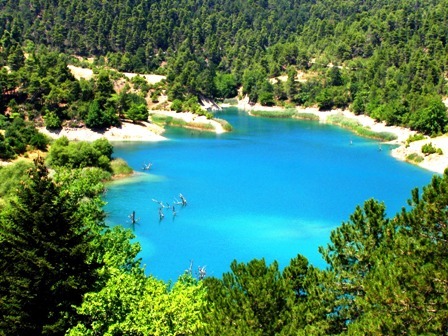 Tsivlou Lake, 37 km from Kalavrita, through the provincial road Sarantapicho - Water of Styx towards the road of Akrata - Zarouchla, 33 km from Georgios V Chalet Kalavrita. Tsivlou Lake created in 1912 by a landslide that dammed Krathis river bed, it lies on the path to Zarouchla from Akrata junction. A dot that is "embraced" by the green slopes of Chelmos. Many people choose its shores for a walk, even for swimming in the summer, while in winter, for a stroll on the paths around it. It is a colorful scene, with all the variety of green of the world to be mirrored in its waters with the yellow, red and brown of fallen leaves. Very close to Tsivlou Lake is the traditional village of Zarouchla. A mountainous village on the southeastern slopes of Chelmos, numbering 70 residents reputed builders of stone. Through the village flows the stream of Assopos River, which joins to Krathis, a few kilometers away. Cobbled streets, fountains and quite well-preserved tower houses surrounded by trees, chestnut and walnut trees, compose the stunning backdrop of beautiful Zarouchla. 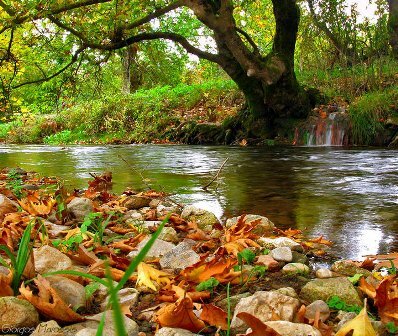 Vouraikos is a river that stems from Chelmos in Priolithos village or Syrmpani and flows into near Diakopto, the village of actor Dionysis Papagiannopoulos. The name comes from Voura, according to mythology, for her, her beloved Heracles opened the canyon in order to cross it and reach to the sea to meet her. 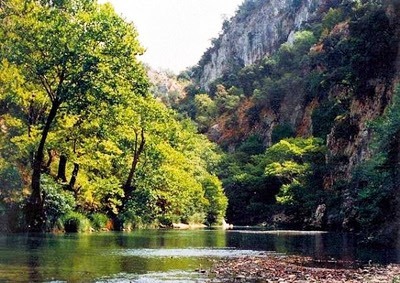 The Canyon of Vouraikos has a length of 20 km and the river that crosses it is surrounded by cliffs, dense vegetation, waterfalls, bridges and caves. Companion of the river is the cog railway. 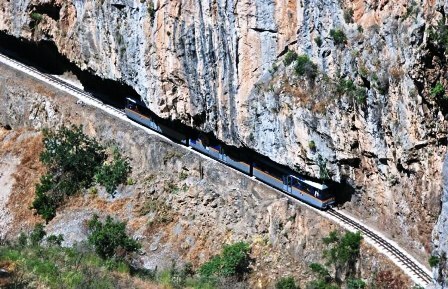 It is a narrow railway connecting Diakopto to Kalavrita. 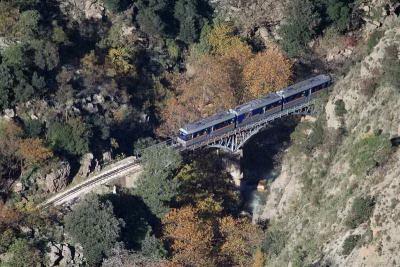 The most mountainous “odontotos train” in Greece that hooks the gears on the rails, when the slope exceeds 10 % in order to cross Vouraikos gorge. Passing through tunnels and bridges, in a distance of 22 km, the cog railway bountifully offers us an unforgettable experience. Huge cliffs, streams and lush vegetation of plane, fir and oleander trees, give another plus to the magical train ride of Kalavrita. 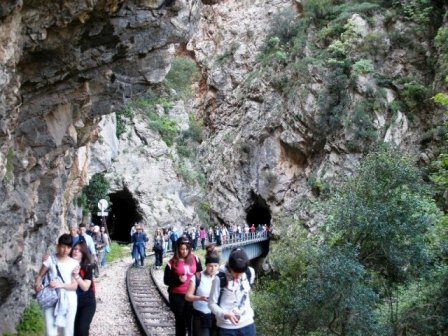 The so-called "Moutzouris”, passes successive through narrow tunnels and tall bridges. Do not forget to snap a picture of “Dikastirio” on your left, a cave with stalagmite rocks reminiscent courtroom. 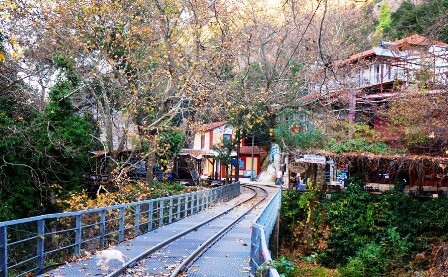 In the middle of the route, after 12 kilometers, the cog train stops for a while in Zahlorou. A green village, a destination that serves monastery’s guests or the climbers, walkers and hikers, the nature lovers in E4 path that lasts 5-6 hours to Kalavrita.